Reid, who is 79, does not have long to live. I hate to be so abrupt about this, but Reid probably would not mind. In May, he went in for a colonoscopy, the results of which caused concern among his doctors. This led to an M.R.I. 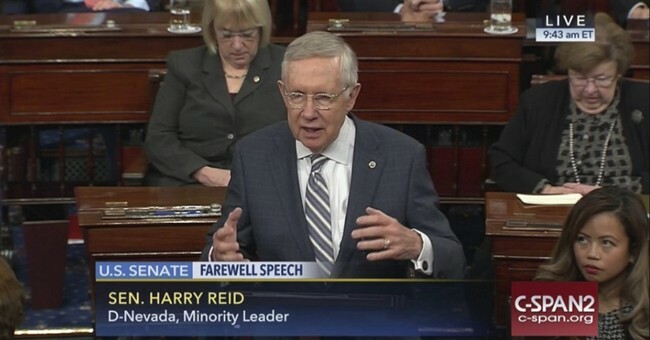 that turned up a lesion on Reid’s pancreas: cancer. Reid’s subdued and slightly cold manner, and aggressive anticharisma, have always made him an admirably blunt assessor of situations, including, now, his own: “As soon as you discover you have something on your pancreas, you’re dead.” I had planned to visit Reid, who had not granted an interview since his cancer diagnosis, in November, but he put me off, saying he felt too weak. People close to him were saying that he had months left, if not weeks. Reid himself always seemed more predisposed to believing that the arc of the universe bent toward an ornery brawl. Reid once called the Federal Reserve chairman Alan Greenspan a “political hack,” Justice Clarence Thomas “an embarrassment” and President George W. Bush a “loser” (for which he later apologized) and a “liar” (for which he did not). In 2016, he dismissed Trump as “a big fat guy” who “didn’t win many fights.” Reid himself was more than ready to fight, and fight dirty: “I was always willing to do things that others were not willing to do,” he told me. During the 2012 presidential campaign, he claimed, with no proof, that Mitt Romney had not paid any taxes over the past decade. Romney released tax returns showing that he did. After the election, Reid told CNN by way of self-justification, “Romney didn’t win, did he?” Reid took rightful criticism over this. So that’s a total of 3900 Senate hours, which means 163 days of Senate meeting 24/7, so they could clear the backlog IF THEY WORK. They can be done by mid-May (though new judicial vacancies will arrive and keep Senate longer.) Or they can use #TheReidaRule. But they have to act! I fully supported McConnell applying the 'Reid Rule' to the Gorsuch SCOTUS nomination, and applauded further hardball maneuvers when Democrats tripled down on obstructionism. Whether additional steps are justified may depend on the minority's conduct in the coming months. Because these fights have become exceptionally high-stakes, zero-sum battles, and because the GOP is unlikely to notch many conservative legislative accomplishments with Nancy Pelosi as House Speaker, the elevation of qualified originalist jurists is the single most important task Republican Senators are faced with over the next two years. Advantages are notoriously transitory in politics, so this moment in time must be exploited to the maximum extent possible. Thankfully, Harry Reid's Republican successor seems to understand this quite well.